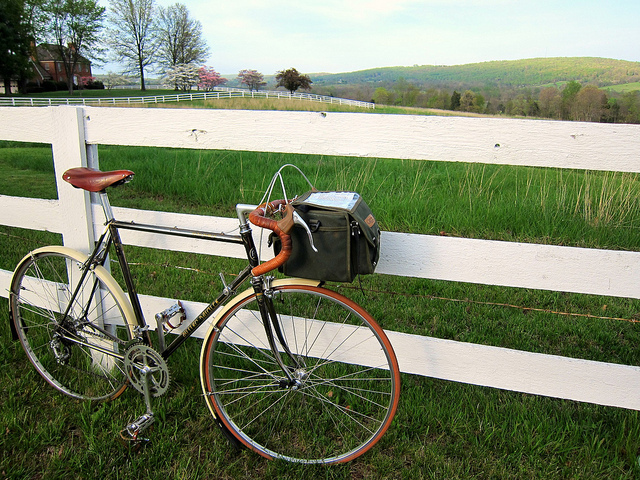 This year I’ve had the pleasure of meeting and riding with Ritchie, a D.C. Randonneur. The first time I saw Ritchie, I had to rub my eyes and take a second look to make sure he was real. He looked liked he might have stepped out of a time machine and somehow ended up on our ride. I later learned that he had not emerged from a time machine; he just embraces vintage treasure. Ritchie’s Austro-Daimler is one of those treasures, and I asked him to tell me more about it. 1. What kind of bike do you have? I have a 1979 Austro-Daimler Vent Noir II. 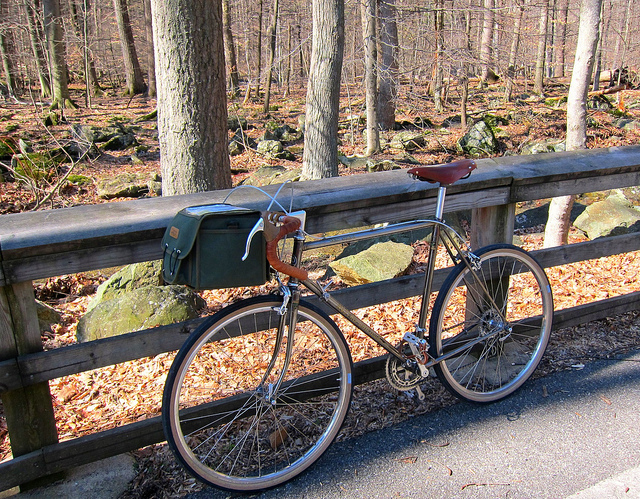 That’s well-aged and lovingly lugged Reynolds 531 steel, baby! It’s one of the more unique products of the ’70s bike boom, which was marketed by its manufacturer, Steyr-Daimler-Puch, as being a European thoroughbred with no Asian parts. I’m still riding it with 100% of the original Campagnolo Nuovo Gran Sport Gruppo – right down to the seat post and pedals. If you’re not familiar with Steyr-Daimler-Puch (And why would you be? It’s sooo defunct these days.) this was an Austrian manufacturing firm founded in the late 1800s that made everything from guns and mopeds to cars and beginning in 1901 … bikes! Puch bikes spring from this same company, in fact there are Vent Noir IIs that boast Puch headbadges instead of Austro-Daimler. The company has a somewhat crazy, slightly nefarious lineage that weaves itself through the travails of early 20th century European history. 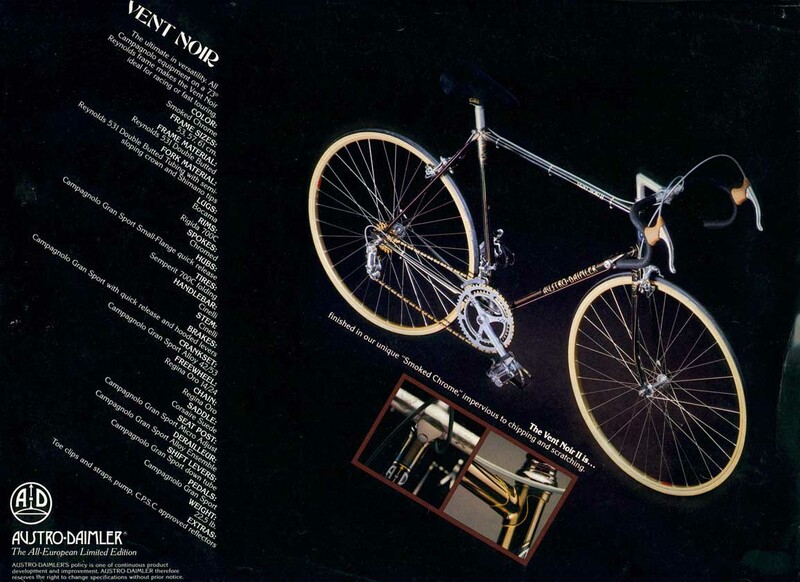 An excellent chronicle can be found here, and a catalogue page for the 1978 Vent Noir II is here. 2. Where do you ride it? Generally I ride it any direction a Sunday might move me – around to museums, out to Old Town or Bethesda along the greenways, or on the roads outside of town. This isn’t my go-to commuter. I treat it a little better than that. But I will break it out if I’m running late and need to get to work fast on a sunny day. 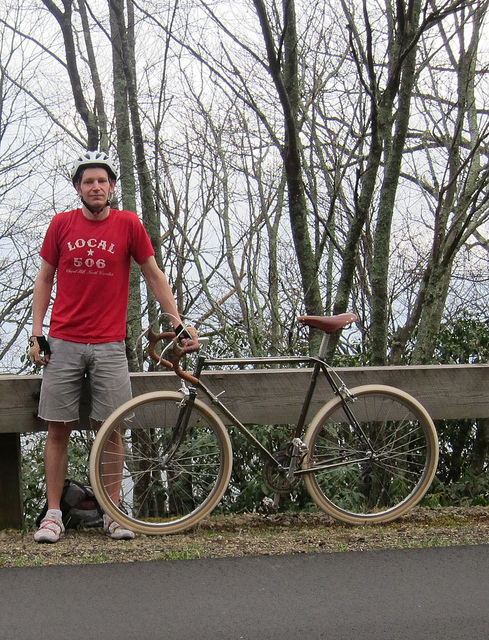 Lately I have been putting it through its paces with some D.C. Randonneur brevets and a ride on the Blue Ridge Parkway in Asheville, North Carolina. The bike has performed better on these rides than I have. 3. What do you like about your bike? I friggin’ love the smoked chrome finish. This was a “secret” finish that Daimler deemed “unscratchable.” That might have been an exaggeration but it is tough stuff. This isn’t the sort of chroming they use for hubcaps and Bianchi Pistas – it’s not going to flake off. This is the chrome they use on aircraft engine crank cases. Serious business. It’s not as flashy as other chromes. Takes a minute to sink in. It’s subtle and understated, and I like that. 4. If you had to describe your bike in one word, what would it be? Stealth. I’m no fan of the military-industrial complex, but on its more ingenious days it popped out a few machines of extremely sleek design, made of some truly wild materials. The B-2 stealth bomber springs to mind. When this bike is sailing along nearly silent and simultaneously seeming to absorb and reflect all light, it makes me feel all stealth bombery. 5. Fenders or no fenders? That all depends on the weather forecast on my pocket-computer-phone-like-app-driven device. Regrettably this model year did not come with fender eyelets—or rack and water bottle braze-ons for that matter. (I know, WTF Heck?) But I like to keep things clean so I’ve rigged a set of SKS longboard fenders (the cream ones sold through Rivendell … but don’t cop my style) with some small P-clamps that fit snuggly just above the front and rear drop-outs. They are easy on and off, which lets me make game-day mudguard decisions. 6. Does your bike have a name? If so, what is it? I haven’t anthropomorphized this bike yet, but the model name “Vent Noir” is French for “black wind.” And don’t think for a second that the coolness of riding the dark winds was lost on me. I do sometimes call the rear derailleur some choice names when it starts getting shi(f/t)ty on steep grades. 7. What is your favorite accessory on your bike and why? 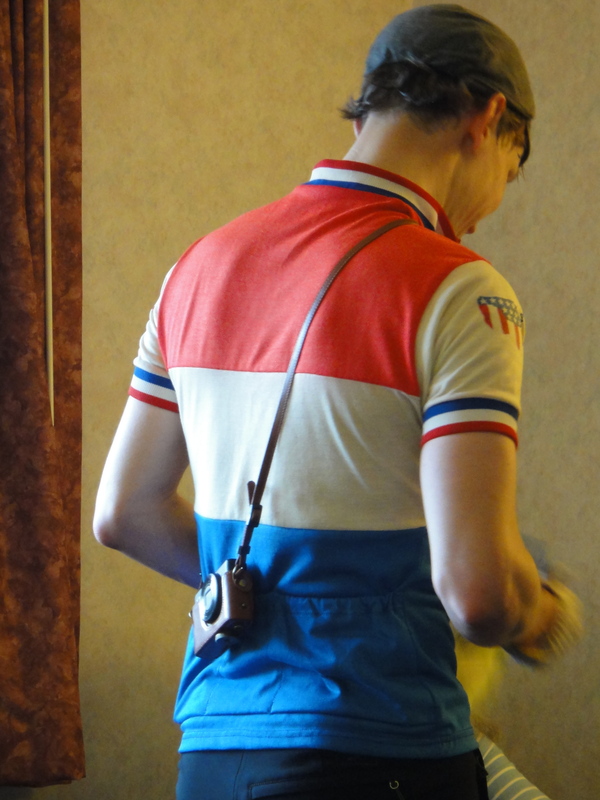 Right now that would be the Ostrich handlebar bag and the very-handy Velo Orange rackaleur that allows me to carry it. While I respect minimalists and all that they do (or don’t do), I am not one of them. I find it nearly impossible to pack light. 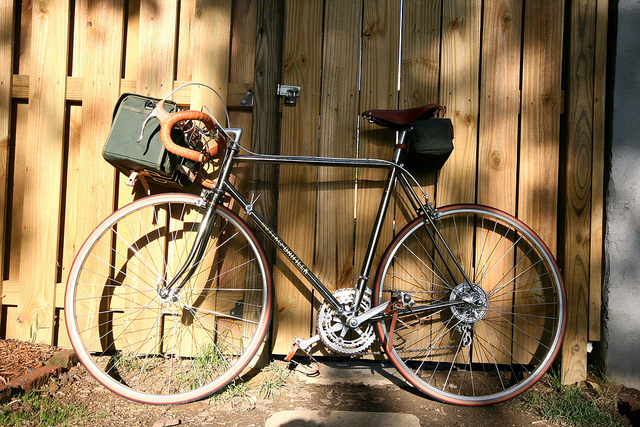 A featherweight carbon frame would be lost on me, because I would have 20 pounds of luggage hanging from its saddle. That said, when my derailleur cage flies to bits in the middle of the road, I’m glad I have this big boxy bag. It’s filled with all the not-so essentials, like the tiny spanner I need to repair and carry on. Sometimes I feel like Mary Poppins with all I pull out of this bag, including the snacks that contain way more than a spoonful of sugar. 8. What is your favorite photo of your bike/your bike and you? 9. What about that 650B conversion? How does riding the bike as a 650B conversion compare to the 700C ride? One of the many positive points of these older frames (along with a fresh and welcomed wave of new designs by companies like Rivendell, Velo Orange, and Soma) is the way they open themselves up to mechanical experimentation. They’re like cars before they went all computerized—easier to customize. This frame has a generous chainstay clearance that begged me to try out my favorite wheel size, 650B. For the same reason that I like Brooks saddles and leather bar tape, I love the buttery smooth ride of 650B. And slapping on a set of Tektro 556 long-reach calipers is really all it takes to let me run any 650B tire up to the voluptuous and bouncy 42mm Grand Bois Hetres (with <1mm of clearance to spare). But some days you want to slice across the road, rather than float. On those days I can be back on 700c road skinnies in just 15 minutes. 10. What about that camera case?? Ritchie. Vintage jersey and camera case. If I love any pastime as much as riding, it’s photography. For shooting while riding, my weapon of choice is the tiny but sharp Canon s95. It has all the dressings of a big juicy SLR turkey stuffed inside an itty-bitty quail body. Unfortunately a tiny camera is tough to hold onto while you’re pedaling, so I found a vintage-looking leather case made for Canons that lets me keep the camera hung safely around my neck at all times. Just search “Canon s95 leather case” on the Bay, and you can find one super cheap (probably a knock-off, but hey) that will arrive—literally—on a slow boat from China. 11. What did I forget to ask that you want to tell me about your bike? Well, while you’re not asking, this actually isn’t my first Vent Noir II. The first one came with a seat post so epically seized that it became my Excalibur. Unfortunately that sword is still in the stone, but that is a long (and educational) tale of trial and error that I’ll leave for another day. Thanks for the beautiful pics and story of your bicycle. I had no idea the parts were all original! 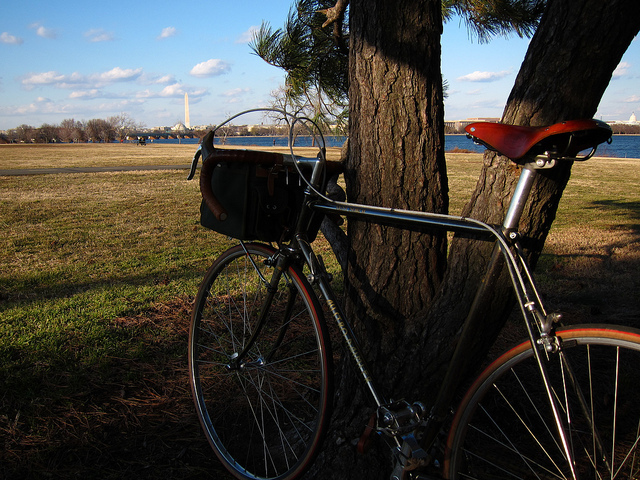 Also, Ritchie has an excellent flickr photostream that includes a couple of our D.C. Randonneurs rides. Check it out here. Wow! That’s one pretty bike! And one I’ve long admired, since I was a teenager and this bike was new. Would love to find one my size some day. That’s a beautiful vintage bike, especially with the hetres. I’m wondering why the hetres were only on briefly? Ah, Puch bikes. My friend Becca had one in college back in the ’70s in Boston. She lived in a 3rd floor walk up and kept it on the deck outside her apartment. Until, that is, some SOB climbed up the outside of the building and stole it. She was heartbroken. I love the Local 506 tshirt even more than the bike! I have a ’77 Vent Noir with about 8,000 miles on it. Riders ask what’s that? as they zip past me up the hill on their plastic bikes. No worries, I ALWAYS catch them on the next downhill! Just looking for possibilities to convert my ’79 V-N ll to 650b and here it is! Thanks a million!